CARtoon of a 1979 Toyota HiLux four wheel drive pickup truck. I used to have a 1979 Toyota pickup of my very own. 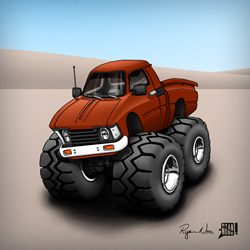 It wasn’t a high rise four wheel drive as the CARtoon above portrays, but it was almost the same color… originally. 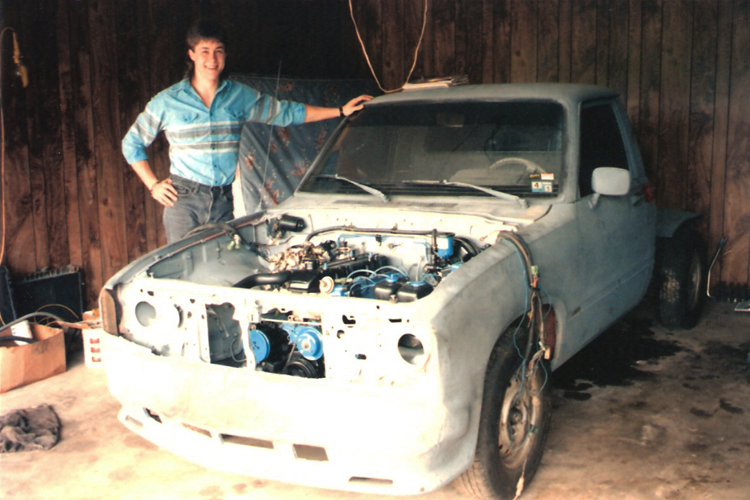 Below is a photo of my “Tonka Toy” shortly after having rebuilt the engine. It is between paint jobs and sporting a grey primed finish for the stealth like appearance. Prior to the grey primer it was primed black, and afterwards it was grey with teal scallops, and then finally white with black rocker panels. Pixel Paintings car, caricature, cartoon, CARtoons magazine, comic, digital, drawing, George Trosley, GIMP, illustration, monster, MyPaint, painting, Photoshop, portrait, truck. permalink.